This mod doesn't work on 1.8.8. Do you have sitting functionality yet? If not, there's a new post about it here. Actually, I do have sitting working and I'm just tying up some loose ends for an updated post.... stay tuned. Certainly no problem on the error. I'm always happy to test stuff out. With supporting Dr. Cyano's work, are you considering his Mineralogy mod? Yes, I've been playing a bit with mineralogy and I could see Pillars and wedges in all those stones... Working on a project for my daughter first, but I'm keeping this on my list. I'm also thinking about supporting biomes o plenty woods. I'm working on getting source in github and then I'll post a link... but it may be a week or so. Erian_7, Thanks for the post. it was a simple error on my part and I've posted 1.1.1 of the missing_pieces4Basementals which has now been tested on a server. Sorry for the inconvenience. Enjoy the new light sources! Getting a Server crash with the child mod; works fine on just the Client. Base Metals support is great--I'll test that out today. 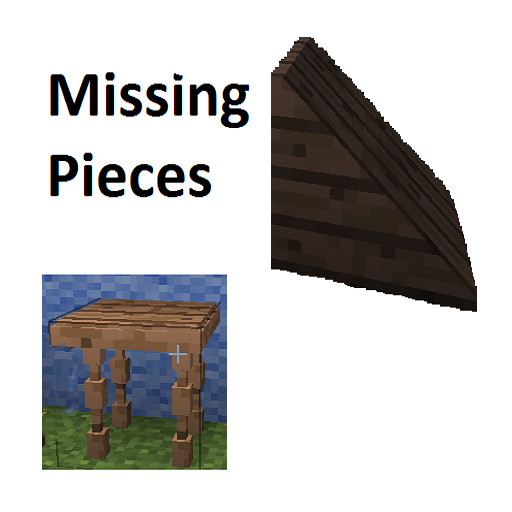 I'm looking to possibly replace the Architecture Craft mod with this one, as the former has some issues with blocks reverting to a Vanilla wedge block. I would be happy to try ,and back port this to 1.7.10 if I had a source . One way to allow sitting in chairs is to make them Entities like EntityBoat to use the built in riding entity tools (you could return false in canBePushed() to keep it in one place). Another way is to use onBlockActivated and set the EntityPlayer's position and render sitting then. The block would need to keep track of the player's previous position for when he/she exits the chair. Thanks for the sitting tips. I'll explore them and see what I can come up with. My current project is supporting basemetals with a child mod. I haven't figured out how to sit in the chair...so they are decorative right now. If someone can point out how to sit in the chair I would be happy to add it. Additionally, I haven't figured out how to reference blocks from other mods, but I'd be happy to add support for base metals and oredictionary. Anyone have pointers? Looks amazing! I know how annoying it is to add block textures in 1.8, so you've really accomplished something. One question: can I sit in the chairs or are they just decor? Porting to 1.7.10 is not on my list for this mod. Part of the reason for making this mod is that some of my favorite objects (like a lamp and shelf) are in 1.7.10 mods which haven't migrated to 1.8 yet. I know that there is a big change required from 1.7.10 to 1.8 and I respect the developers who decide not to make the move, but I am hoping to encourage the community to embrace the newer versions. I'm going to do that by providing a mod or mods with interesting objects and activities... stay tuned. That said, I will shortly post my source code for this mod so anyone who wants to port it back to 1.7.10 can start there. First the easy question: yes, it has a config file in the config directory which allows you to enable/disable each block/item so you can turn off the ones that you don't want. As for metal versions, I hadn't thought about those, but they should be easy. I'm' assuming that you are thinking about gold and iron... any other type requests? will you also do metal versions for the lamps and candelabras? also is it possible to disable parts of the mod per block type? EG turning off/disabling the wedges and pillars(they dont do it for me but the rest is awesome)?